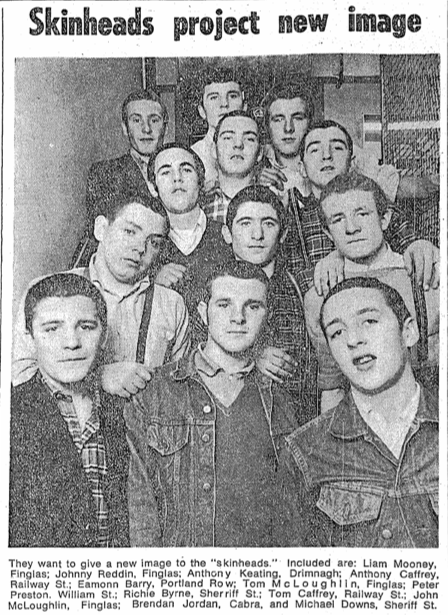 Dublin Skinheads in 1970 Sunday Indo article | Come Here To Me! Members of Dublin’s only skinhead club are out to dispel the image many of the public have of them being drug users, troublemakers and street-corner idlers. This afternoon 100 of the city’s poor children will crowd into their tiny club, the “Boot Inn”, in Middle Abbey Street for a Halloween party. The basement club has been specially decorated for the occasion and all the members of the club chipped in 10/- each for party hats, balloons, minerals and food. Yesterday they treated 40 other children to a big party at the club and immediately afterwards the skinheads began cleaning up the place and washing the dishes for today’s party. The skinheads are planning another big “do” for these children at Christmas. Meanwhile they are in the process of forming their own football team and hope to enter one of the city’s football leagues. Nineteen-year-old John McKoughlin, Finglas West, who is manager of the club, said: “We just want to try and correct thus bad image which the public has of us. We are barred from every dancehall in Dublin while long haired youths are allowed in. None of our members has ever been in trouble and we have a commitment at all our dances to prevent drug-pushers entering the club. We don’t allow drugs in our club”. Another leading member of the club, Thomas Caffrey (21), Liberty House, said that other skinheads – there are about 500 in Dublin – had tried to force their way into the club, but they were stopped. Sunday Independent – Nov 01, 1970. For similar newspaper cuttings and pictures, check out the ever expanding photo album from the Where Were You? Facebook page. I recognise one of those names. He was well known around the area. I saw him in action one night outside a house party in Finglas. He was used a bicycle chain and finished off with a cavity block he threw at the other guys head. I’d almost forgotten it up to now. The guy who jumped in and broke up the fight when one party had clearly lost later became a managing director in Smurfits on Botanic road. The police came well after it was all over. The gang in the house, all scuttered, tried to bluff it when the cops arrived. All the lights had been turned off and the house was silent. The copper started banging on the door and peering in the letter box. He was shouting “open this door”. Then someone in the house, in as serious a voice he could manage after 10 pints started repeating “this is a recording there is no one here, this is a recording there is no one here”. Then they all joined in to a background of sniggers. It didn’t work. Them were the days. Ah gas! Have you seen the book that’s been printed? Where were you? Try pick it up,great pictures you may recognise a few people in it. Not one of them has a skinhead! Most of them look like they’ve got 3’s or 4’s, which would have been in keeping with what a lot of skinheads had back then. The boneheads came later. Todd Fletcher in Liffey Street was very popular. He was upstairs above what is now a shoe shop alongside Probys Lane opposite Marks and Spencer. He was usually referred to as Sweeney Todd. My mate had tight black curly hair and when he got his had buzzed his shiny white scalp was showing through. He panicked before we got home. His Ma caught us down the back lane trying to paint his head with a cheap watercolour set so it wouldn’t look so bad. Today, near where one of those in the photo used to live, I was told he was shot dead some years ago. Where Were You is out now. They could follow it up with Where Did Ya Go. that pic was a great find.the limerick leader has some good articles,and one or two pics of skinhead violence at limerick fc games,and between them and sligo rovers and cork hibs and celtic.a number of early 70,s clashes involving skinhead gangs featured.that was a great pic,hadnt seen it.the other one of them outside the newly set up boot in is known in skinhead circles and a spanish skinhead band from valencia used it on an album cover.